I have been an enthusiastic reader of food blogs for about 4 years. Our meals are frequently cooked from recipes gleaned from my trusted blog haunts. I love reading about the cooking adventures of this group of talented home chefs. Sure, I have plenty of cookbooks written by professional chefs/bakers and test kitchens. But you can’t email a test kitchen with a question and get a timely (if ever) response or see a photo of the professional baker’s toddler enjoying their birthday cake. Bloggers seek and give feedback. While sharing an enthusiasm for cooking, with tid bits of life stories thrown in for flavor, bloggers forge virtual (and sometimes real life) friendships with their readers. Inspiration abounds in the blogisphere. 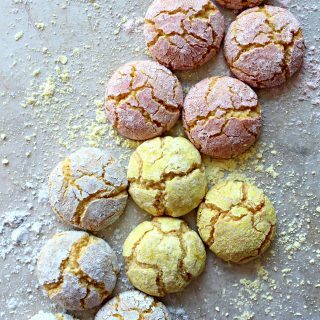 Sometimes I am looking for a specific kind of inspiration; flavors to pair with white chocolate, Thanksgiving sugar cookies, brownies that survive being shipped to the desert. 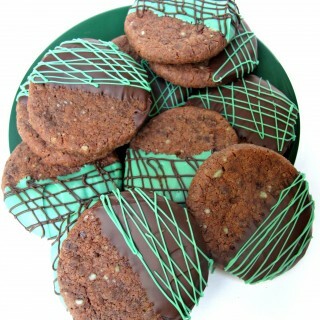 Sometimes inspiration finds me, resulting in deliciousness like these Chocolate Peppermint Shortbread Cookies. I don’t even remember what I was searching for when I came across Sweet Hope Cookies. It was not a blog I had seen before. I was quickly drawn in by Anita’s story, her humorous conversational writing, and her recipes. 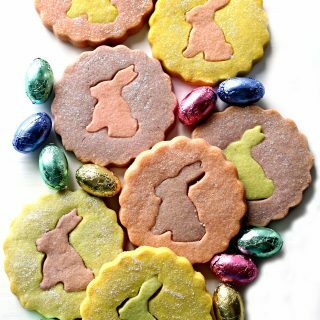 Anita bakes and sells beautifully decorated FLAVORED sugar cookies. One hundred percent of her cookie profits go to the ALS Association in honor of her brother Randy. That tells you already that she has a giving spirit, but she also cheerfully shares her baking secrets on her blog. If you want to order cookies, she can help you out. If you want to bake them yourself, she can help you there too! There are a number of cookie concepts percolating in my mind using some of Anita’s baking methods. There is one method that I am especially excited about and I put to immediate use in these Chocolate Peppermint Shortbread Cookies. This fantastic idea, that Anita frequently uses to flavor her cookies, is referred to by the very technical term, “de-chipping” by which baking chips (chocolate chips, peanut butter chips, mint chips, etc.) are chopped to smithereens in the food processor before adding them to the cookie dough. These tiny morsels of flavor disperse throughout the dough, boosting flavor and texture. They can even be added to roll-out or slice-and-bake dough. Regular or even mini-chips give a bumpy surface to roll-out dough and make it difficult to evenly cut a slice-and-bake log. The “de-chipped” flavor bits are so tiny that rolling or cutting are no problem. 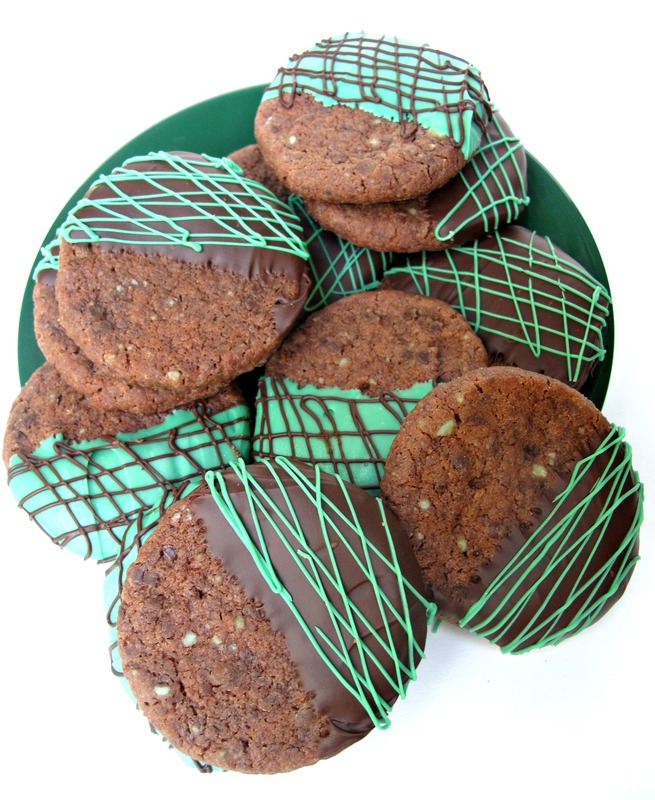 I baked Chocolate Peppermint Shortbread Cookies using the “de-chipping” method with Nestle’s Winter Mix baking chips (dark chocolate and mint chips). Mint chips seem to be a Christmas season item. If you aren’t a chip hoarder like I am, and find yourself in the middle of July without access to mint baking chips, use chocolate chips and add ¼ teaspoon of peppermint extract to the dough. I think you could probably use Andes mints year round as well, but I haven’t tried “de-chipping” them. When “de-chipping”, be sure to process on “pulse”. Short bursts will eventually chop up the chips without melting them. For comparison, I did bake a batch of Chocolate Peppermint Shortbread Cookies with whole mini semi-sweet chocolate chips. The flavor seemed identical. The texture was different. With the tiny “de-chipped” bits dispersed throughout the dough, the cookie has a slight crunch mixed with the melting texture of shortbread. With whole mini chips, there was no crunch, just melty-ness. Both were good. I prefer the crunch. Also, I found the mini chip dough log difficult to slice without the cookies crumbling. For mini chip dough, I recommend following the directions from the original recipe which called for rolling the cookies into individual balls, then flattening with the bottom of a glass. Shortbread cookies are great cool weather (I don’t like sending butter cookies in hot weather) care package cookies. When stored in an airtight container at room temperature Chocolate Peppermint Shortbread Cookies will stay fresh for at least 2 weeks. For long storage/shipping, no or minimal chocolate dipping is recommended. The chocolate coating will begin to look dull and whitish while the cookies remain delicious. 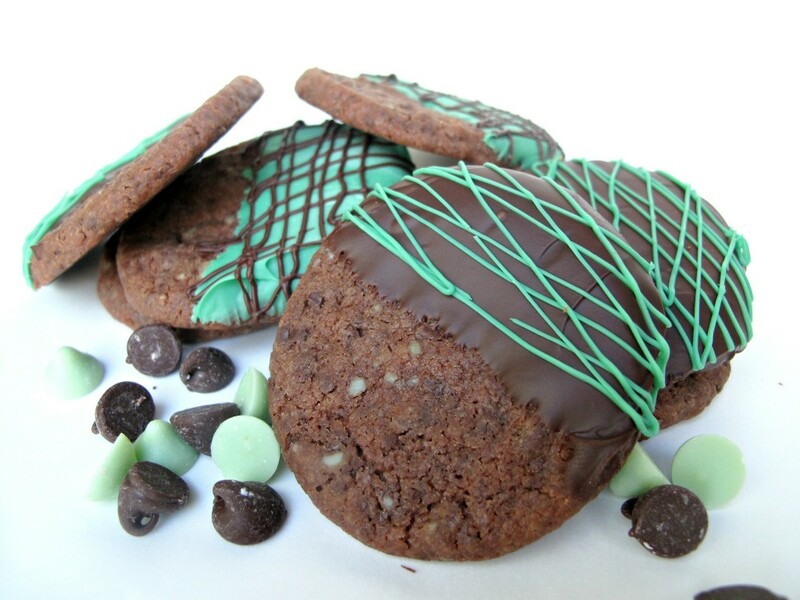 **Important storage or shipping fact** Mint cookies will share their minty-ness with any item they are stored/packed with. 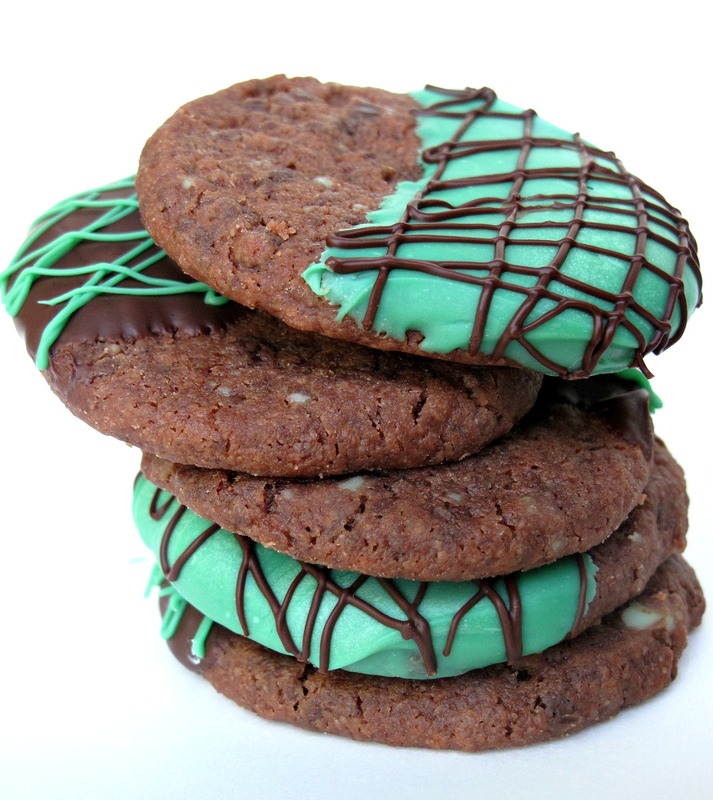 Think mint banana bread, mint peanut butter cookies, or mint sourdough loaf. Not a good thought, is it? 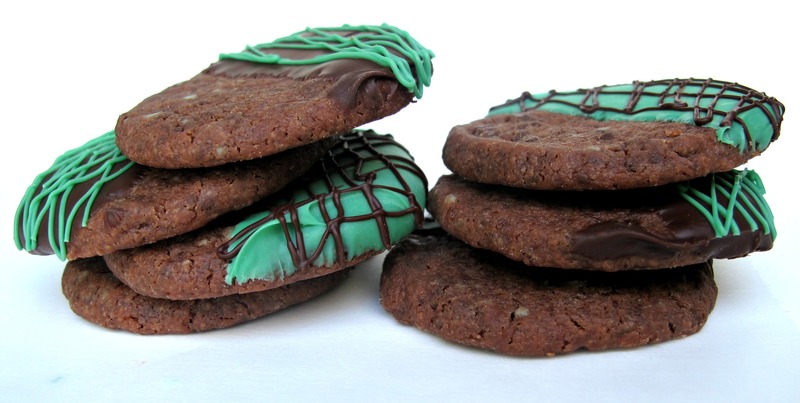 Store your Chocolate Peppermint Shortbread Cookies separately from other cookies. If mailing, make it a mint themed care package. 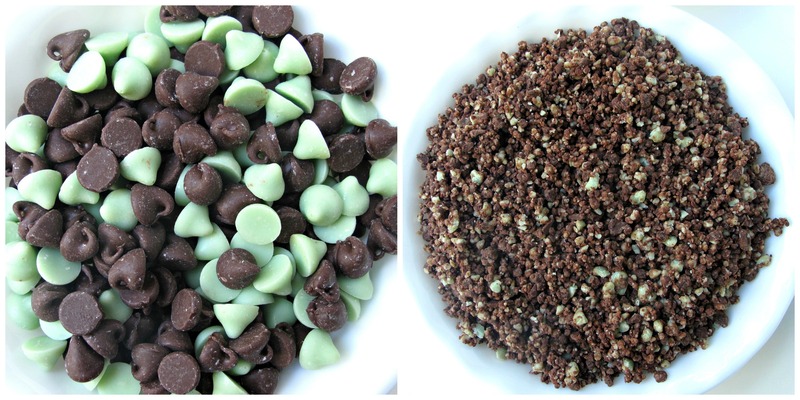 To “de-chip” the chocolate/mint chips, place the chips in the bowl of a food processor. Pulse until finely chopped. Do NOT run the processor with the “on” setting or the chips with melt. In the bowl of an electric mixer, cream together the butter, sugar, and melted chocolate. If using peppermint extract, add it now. Slowly add flour until a dough forms. Form into a log, wrap in wax paper and plastic wrap, and refrigerate until firm enough to slice (about 15 minutes in the freezer or 30 minutes in the fridge). When ready to bake: Pre-heat oven to 375 degrees F. Line a baking sheet with parchment paper. Slice the dough into ¼ – ½ ” thick slices and place on the baking sheet about 1” apart. These cookies spread very little. Bake for 8-9 minutes, until set but not dry looking. Cool for a few minutes on the baking sheet then move to wire racks to cool completely. If dipping in chocolate: In a small bowl, melt the chocolate in the microwave. 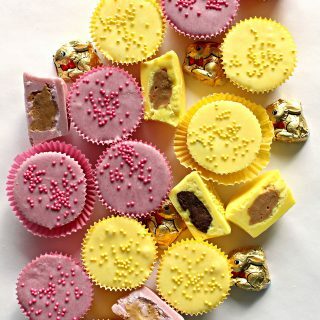 Dip the cooled shortbread into the melted chocolate and place on waxed paper until set. For drizzle decorating, additional chips can be melted in a zip lock bag. Cut a tiny corner off the bottom of the bag in order to pipe drizzle lines. Cookies must be completely cool and/or chocolate completely set before storage. Store at room temperature in an airtight container for at least 2 weeks. Uncooked dough logs can be refrigerated for 3-4 days or frozen for 1 month. Thanks! These are definitely the cookie for a chocolate mint lover. With or without the chocolate dip, they are full of flavor! 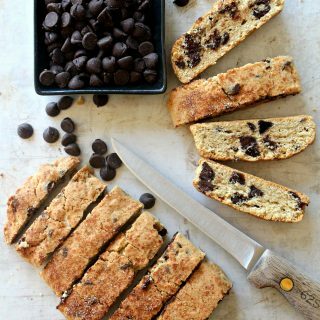 I love when I find a new food blog to follow! It’s so exciting, like picking up a new cookbook from the store. 🙂 These cookies look spectacular, Wendy, and the colors go well for Halloween too! Yum! Thanks, Jess! I feel the same way every time I stumble upon another blog that “speaks to me”. I am constantly astounded at how many talented people there are in the world! Do you ever read a blog and either the pictures or the words make you pause and say,”Wow” ? Thanks for introducing me to Sweet Hope Cookies. What an amazing thing Anita is doing. I always love finding new exciting blogs. Dechipping is the best idea ever. Why in the world have I never thought of doing that? 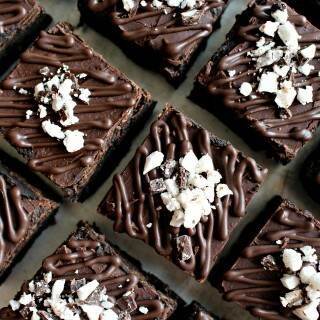 Now you can have chocolate in every single bite. 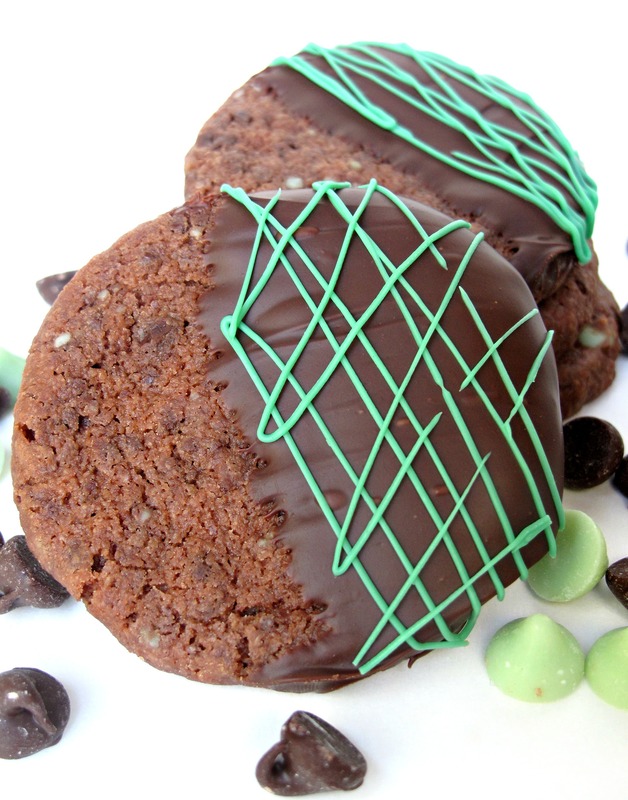 Your cookies look incredible, especially with that glossy dip of chocolate and the pretty criss crosses. You are so welcome, Nancy! I agree, finding new blogs is such fun. Anita’s de-chipping idea is brilliant! But it’s discovering the amazing people behind each blog that is the very best! 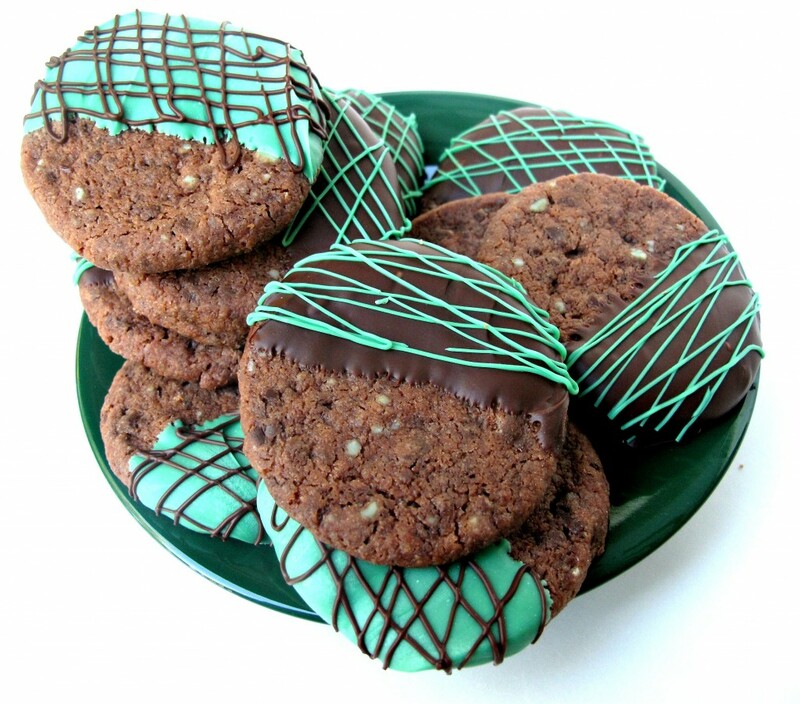 Speaking of the very best….it may very well have been your incredible mint chocolate brownies that got me thinking chocolate mint for these shortbread cookies! I’m glad I helped inspire you to make these. 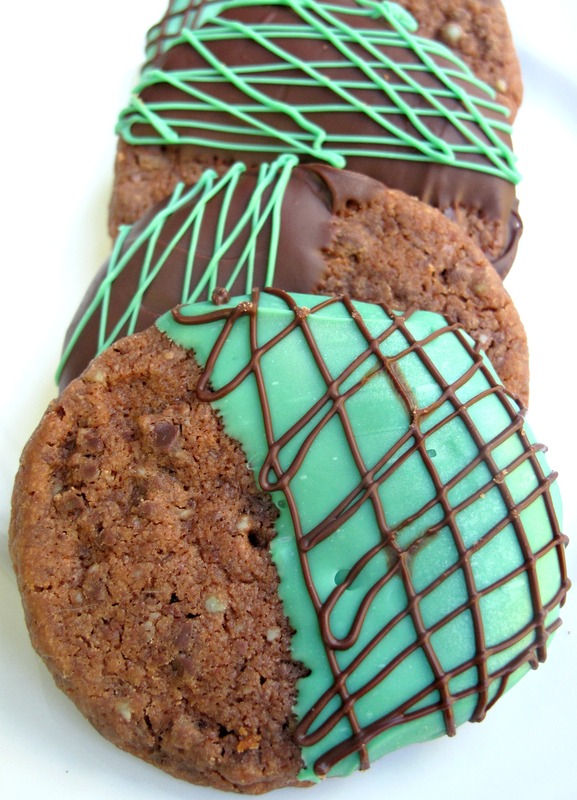 We could all do with a dose of chocolate and mint in our lives! Thank you for sharing Anita’s story. It’s such an inspiring story of LOVE and generosity. Your cookies evoke the excitement that you have from learning and reading food blogs. De-chipping is also new to me and I think I like the idea of having them in tiny morsels. It seems as though every bite will give you a burst of surprise. 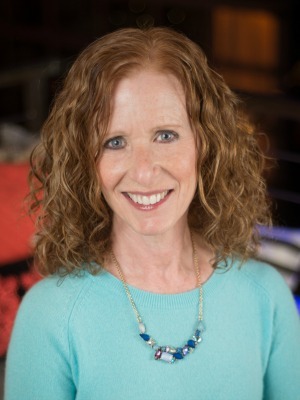 Great to have you around the blogosphere Wendy! Thanks, Jennifer! I need to start applying the “less is more” philosophy. I am seriously drizzle addicted and need to embrace the beauty of a undecorated cookie, especially one as full of flavor as this one. I just have a hard time photographing plain cookies. They tend to look….plain. Any tips? Yummy! Your cookies look realla appealing! Great photos! Thanks, Adriana! I appreciate the encouragement on the photos. Technology aside, food photography is my biggest blogging challenge! Hi Wendy – I’m also loving this “de-chipping” idea. I remember making espresso cookies and grinding the espresso beans gave the cookies such a nice flavor of espresso throughout the entire cookie. And it’s so practical as far as the slicing goes. I’m definitely in the holiday spirit. I love Christmas and your cookies make me think of all the wonderful holiday flavors ahead! The de-chipping works great with roll-out cookies too, Monica! I wasn’t thinking holidays when I made these (we eat chocolate mint year round) but it seems like chocolate mint triggers Christmas thoughts for so many people. (Kind of like “visions of sugar plums”!) I do think that de-chipped chips of all kinds will be awesome for holiday cookies! I can totally get down with these cookies! They disappeared in record time at my house, Julianne! I love these cookies, they’re so festive. I will add them to my holiday cookie collection. These will be perfect to send to a hungry boy living away from home! I sent them to my hungry boy living away from home (and bemoaning that winter has arrived in Chicago!) and he gave them a thumbs up. 🙂 They are especially good with a hot cup of coffee. 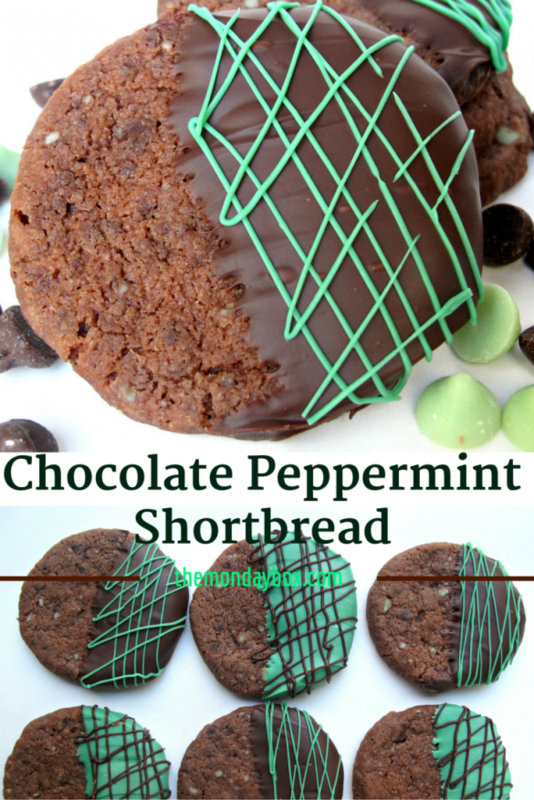 We are BIG peppermint chocolate fans around here so I know these will be made this holiday season! 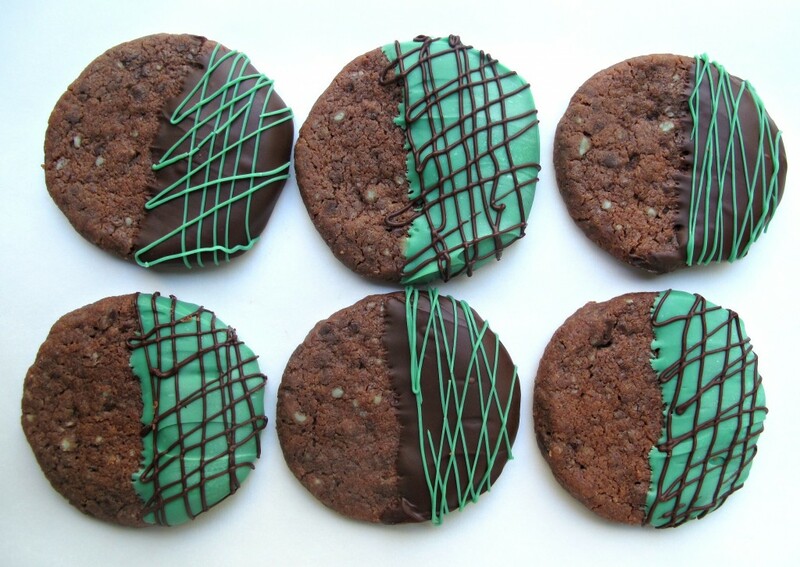 Chocolate and mint, to me, are a combination made in heaven! You are so sweet, Sarah! I would happily send you a plate full! 😉 The funny thing is that these really are a good choice for long distance mailing. They would arrive in France smelling minty and tasting fresh! 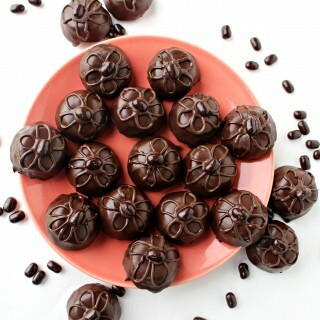 How about a trade; a plate of my cookies for one of your chocolate ganache muffins! Sounds sooo funny ! But I think these muffins won’t be good after a long distance mailing (well, not pretty sure cause these muffins were eaten so fast !) haha ! i do not crave peppermint cookie things until now: this time of year is my season for things like that, especially when paired with chocolate. i love the way you dipped these, and you are SO RIGHT about peppermint things being packaged with anything else: never do that, because flavor mixing will absolutely happen. quick input on the mint chips: they are a seasonal thing (or at least i’ve noticed that to be true), but if you want other alternatives, i think that Michaels sells those candy melts, and they do have a peppermint one you could buy. also, you could melt white chocolate together with some peppermint extract if you wanted the white/green color of the mint chips: they would be more of a vanilla mint, but it’s delicious. Until I started this blog, I had no idea how many flavors are considered “seasonal”! It doesn’t make any difference how many chocolate-mint items are available year round, post some thing chocolate-mint and everyone thinks Christmas! 🙂 A Pavlovian response. Maybe thats why Thin Mints are the biggest selling girl scout cookie. They make people feel festive. 🙂 It is often amazing how powerful the mint smell can be and how many layers of plastic wrap it can seep through! I love the flavored candy melt suggestion!!! I never think of using those in cookies(over cookies of course but until now not IN cookies) and it is an excellent thought!! As you know, I love to dabble with adding color and flavor to melted white chocolate chips but your candy melt idea is faster and also perfect for those not giddy over kitchen experiments! Thanks! You will be seeing that idea put to use soon! Such gorgeous cookies!! Love them! You are a cookie queen. I haven’t tried chocolate shortbread cookies yet. Love this peppermint addition, thanks for sharing with Hearth and soul blog hop, pinning and tweeting. Thank you, Swathi! You are funny! I may not be a cookie queen, but I would agree that these cookies are fit for royalty 😉 . Shortbread is such a great care package, holiday gift, cookie jar cookie!